Gut Sonnenhausen - a particularly precious gem southeast of Munich. This hotel, run as a conference location committed to their organic farming, looks back on a colourful history. Especially with regard to the historic farmhouse, where the stable was unfortunately destroyed by a fire in 2016. It has since been restored and reconstructed with loving attention for detail. Once you leave Munich towards the Southeast it takes only a few kilometres and you will find yourself in an enchanted countryside whose magic can hardly be topped. Extensive walking paths, lush meadows and paddocks and, of course, the Upper Bavarian panorama of the Alps towards Garmisch and Salzburg. You may feel that time stood still in this place - in particular once you approach Gut Sonnenhausen. 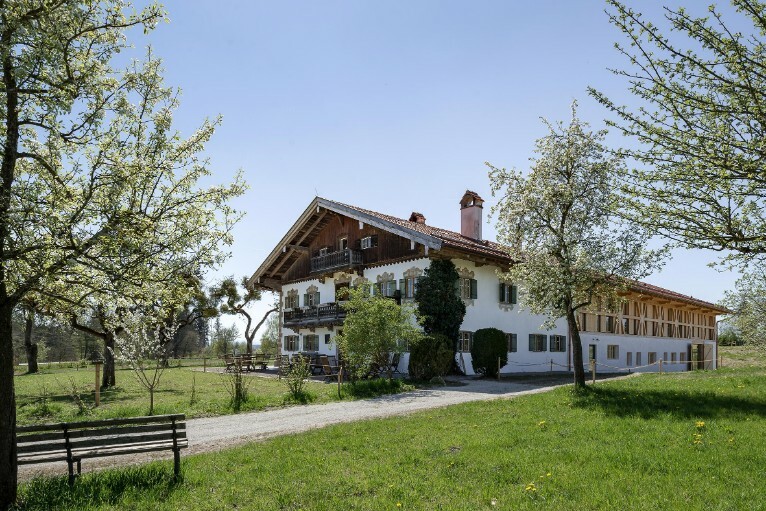 The historic stud farm between Moosach and Glonn has now become a bio-hotel and conference centre specialising on organic farming as are the Hermannsdorfer Landwerkstätten in the neighbourhood, also run by the Schweisfurth family… Georg Schweisfurth, bio-pioneer and owner, lives on the premises and watches over the well-being of the guests personally. The historic farmhouse dating back as far as the 1830’s is a very special gem of the estate. 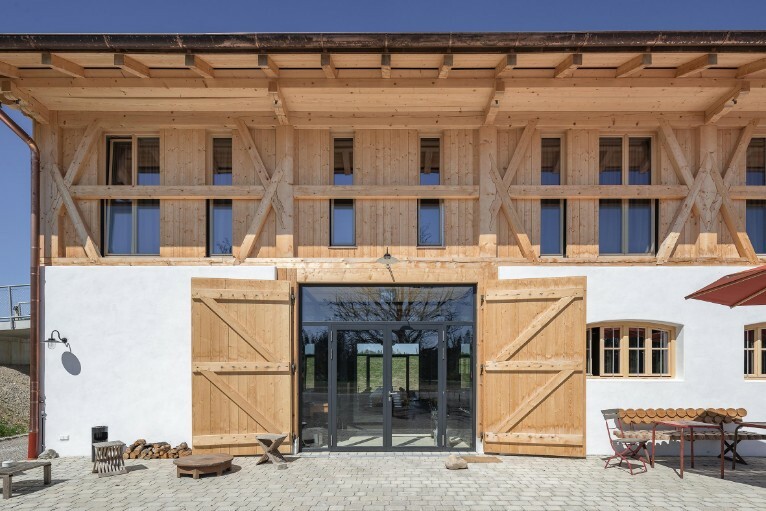 In 2016, it was nearly completely destroyed by fire and the architects vonMeierMohr performed a miracle and resurrected the farmhouse from the ashes like a Phoenix. 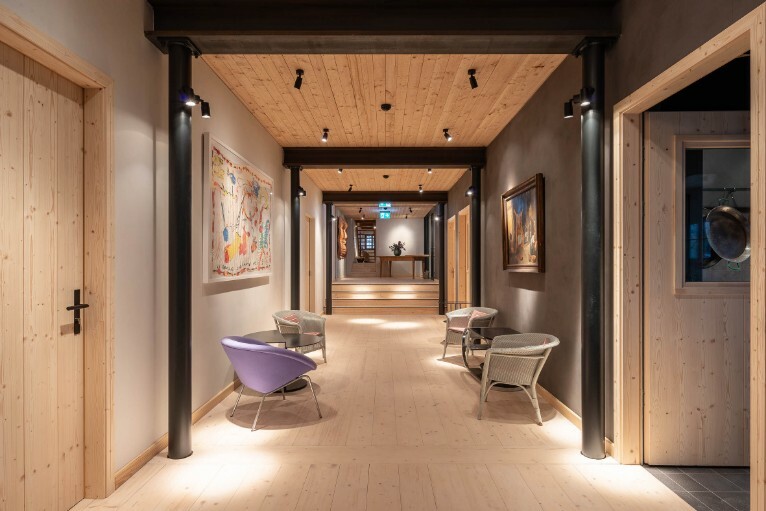 The new gem is located in the centre of the clearing of Sonnenhausen and it has turned out to be exactly as the owner wanted it to be: “simply different”! Gut Sonnenhausen looks back on a colourful history. As early as the Middle Ages, there had been a manor house at this place which was, however, burnt down and destroyed. 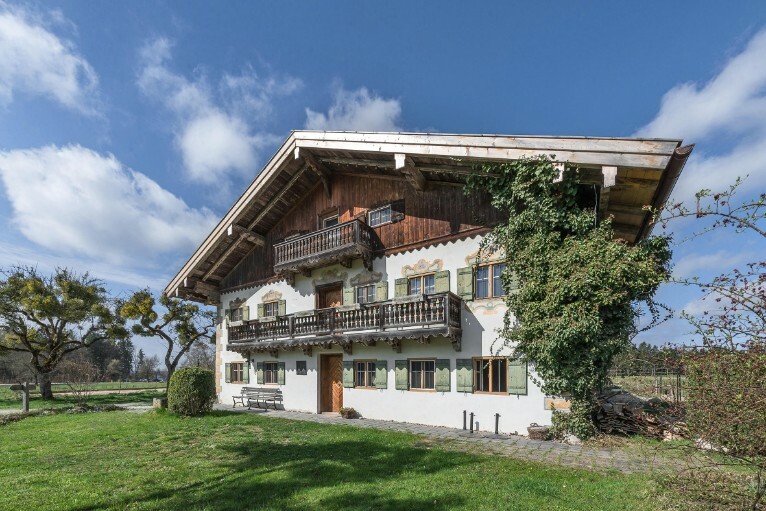 Sometime later a typically Bavarian farmhouse was built at this place with some farmland which was extended in 1900 by a generously-sized three-sided farmyard with stud farm. In the 1960’s nuns inhabited the stud farm and built up a dairy farm and gardening. A short time later horses returned here and the estate even became the training camp and accommodation for horses that took part in the Olympics in 1972. It was in 1985 that the Schweisfurth family acquired the estate and the close-by Gut Herrmannsdorf, that was subsequently turned into a centre for local and regional organic food production. Over the years many parts of the Gut Sonnenhausen buildings have been restored or been converted. In the late summer of 2016 a fire destroyed the stables of the former farmhouse. The only part of the stable not touched by fire and smoke was the façade decorated with a picture of St. Florian, patron saint of the fire brigade. It was only thanks to the quick reaction that the fire brigade was able to prevent the fire to reach the residential building and the rather valuable east façade with its historic wall paintings. The historic building was restored back to life owed to the cooperation between owner, architects, structural engineers, and monument conservators as well as local craftsmen paying loving attention to detail. And it is only for this reason that the restored farmhouse was resurrected like phoenix from the ashes. True to its original design it has altogether three levels. The Farmers Club on the ground floor is an open area for communal use such as events, including a bar and art gallery all in one. There is space for 80 people to celebrate cultural events, birthday parties and also weddings. Many well-planned wall openings turn the interior into a lively place without being overwhelming. 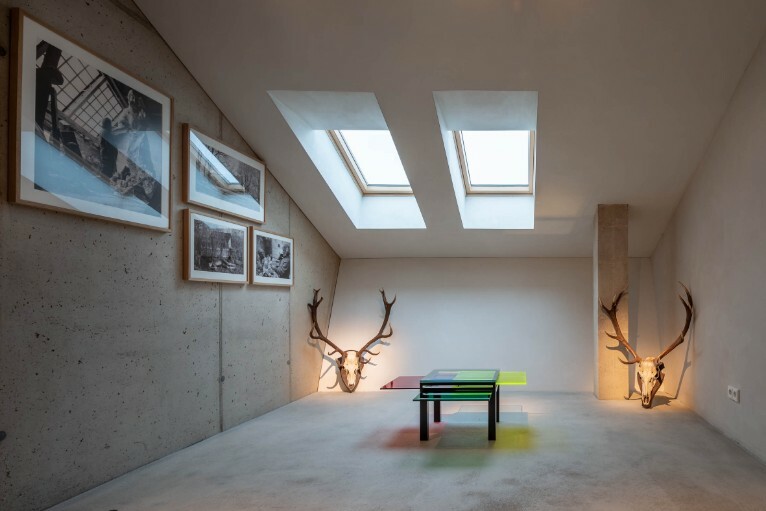 Natural materials such as wood, bricks and clay are the earthy building structure, in contrast to an expressive art, elements of glass and a lot of light that add to a contemporary atmosphere. 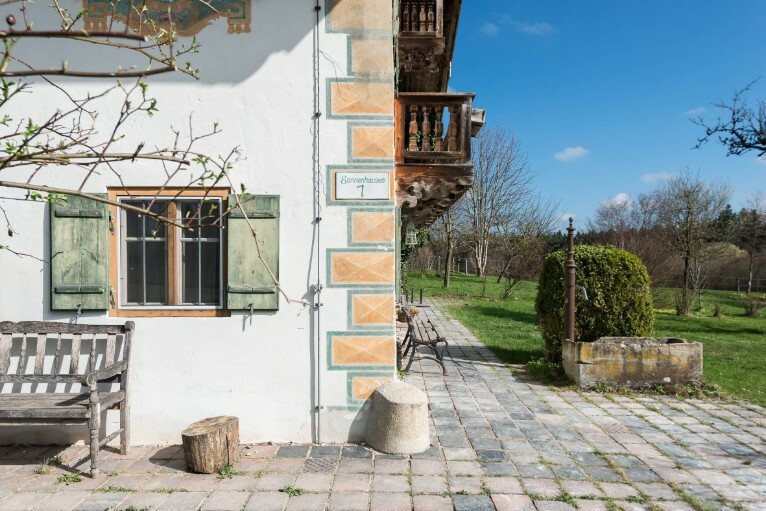 Glazed panels were added to the former stable doors and open up the view towards the garden which once was the grazing area for sheep, right up to the large walnut trees and further ahead towards the Tegernsee alpine upland. Two wing doors open up to the ‘Fire Kitchen‘ with two fire places as in previous times, one of which is an open fire, the other is closed, generating a cosy rustic atmosphere, where food is cooked, baked, fried and smoked. 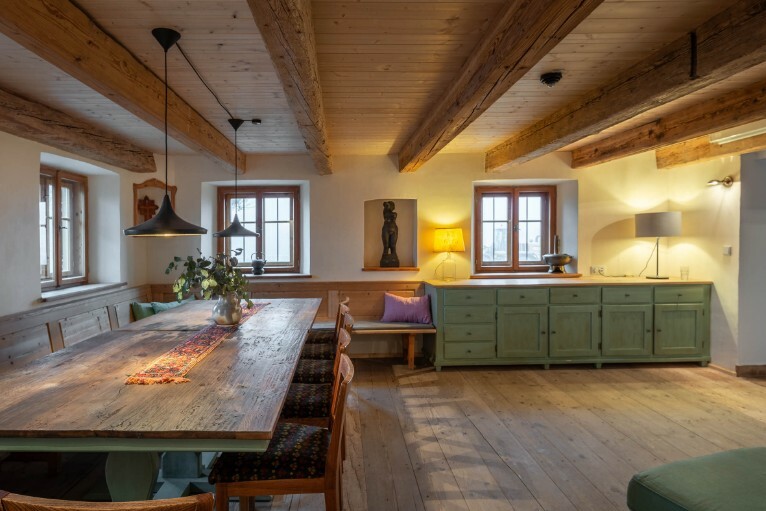 The historic living area of the farmhouse has been restored true to the original. The large living room with open kitchen is predestined for a cosy get-together - during the day, in the evenings after a celebration or in the morning for a hearty country breakfast. New comfortable guest rooms were built on two further levels with views across meadows towards the edge of the forest right up to the mountains. 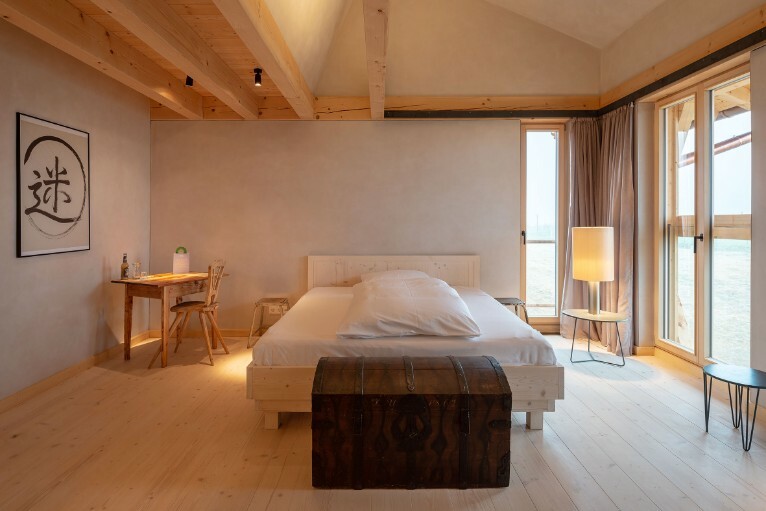 A rustic, most cosy atmosphere is created in all four guest rooms and the farmhouse suite by wooden floors, open ceiling beams and traditional farmhouse furniture. 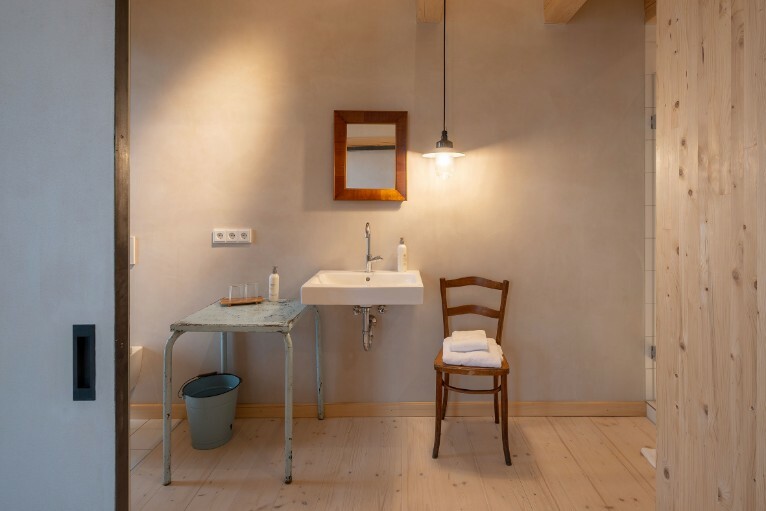 Country-style farmhouse beds and -wardrobes as well as the newly built-in bathrooms with shower offer a most welcome time off and in distinct contrast to the heavily overloaded everyday interior. Untreated pinewood radiates a cosy warmth in all four stable rooms. 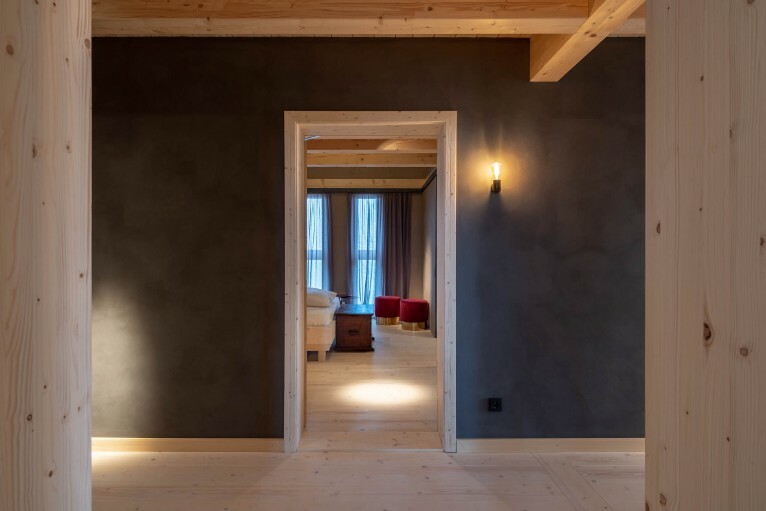 Clay plaster in different natural colours generates a calm and secure atmosphere and the large floor-to-ceiling windows open up a great view into the countryside. 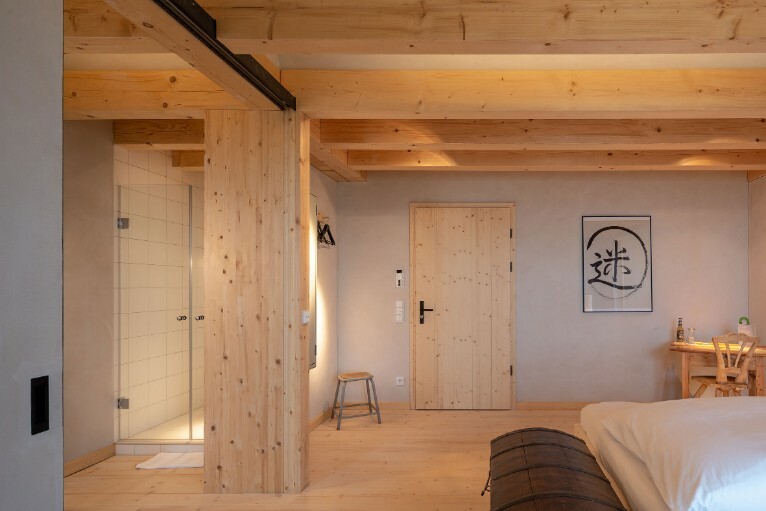 Self-designed beds made of pinewood and some sliding doors connecting the bathroom with shower, thus maintain a quiet and peaceful comfort. The highlights, however, come in form of the two stable suits in the roof. They are located directly under the roof with its strangely sloped ceiling- and gable walls. A completely glazed side wall at the end of the suites appears to open up the room and provides a feeling of openness and also of being one with nature. The bathrooms at this level are equipped with bathtubs. Individual furniture, rustic as well as modern, offer enough space in all rooms for the most necessary commodities and are at the same time an object of art as well as an optically attractive focus. “Respecting the old - that is monument protection - does not stop at the renovation and construction but also enters into designing the rooms“, says Georg Schweisfurth. This is the reason why nothing was left to chance with reference to the building substance and also the interior design. The architects vonMeierMohr from Schondorf am Ammersee signed responsible for implementing the construction work. 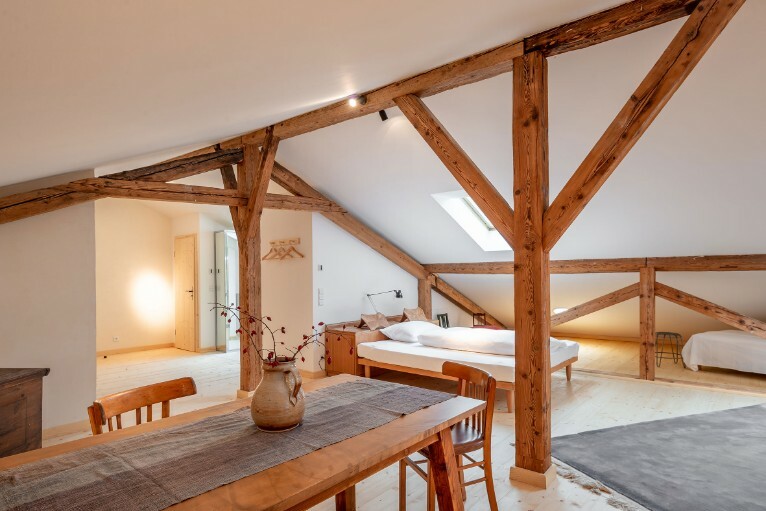 It is only thanks to the close and constructive cooperation between the owner, and the architects as well as the structural engineers and local craftsmen with their knowledge of old constructions and building work that the farmhouse is as vibrant today as never before. 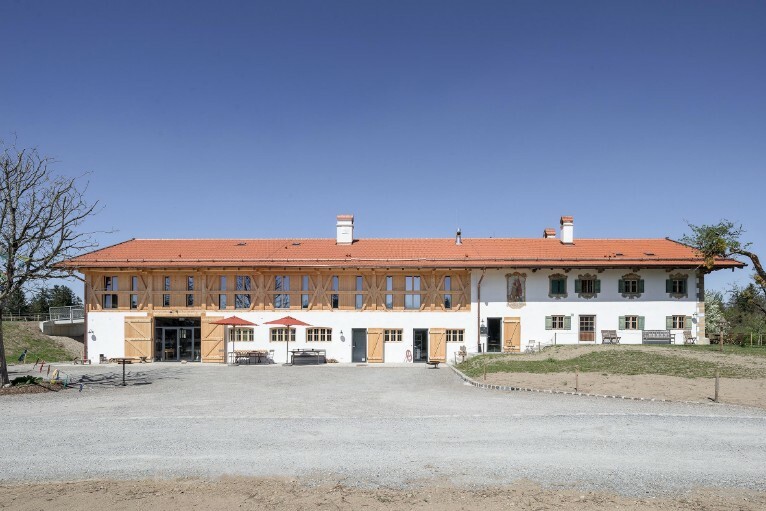 The reconstruction of the stable could be carried out fast and according to the owner’s wishes by maintaining the relevant requirements. 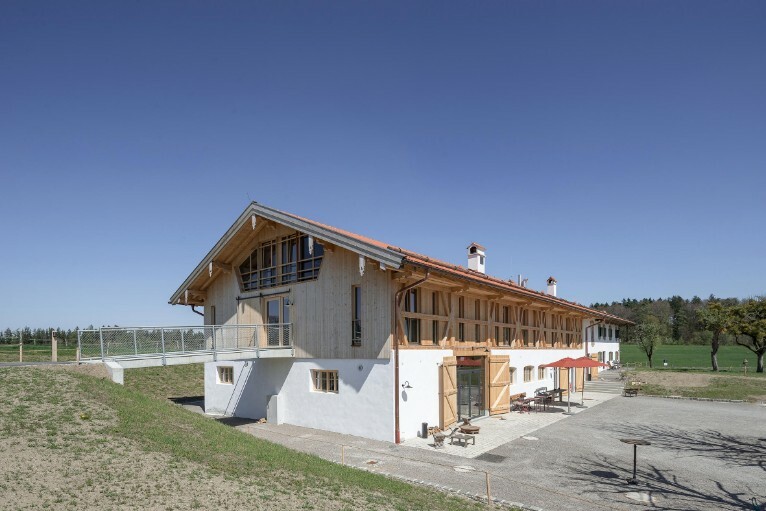 One of the most obvious testimonials of the original construction is definitely the elaborate ‘Bundwerk‘ at the facade, reconstructed by regional craftsmen, that reflects the rural culture of building in the alpine upland. 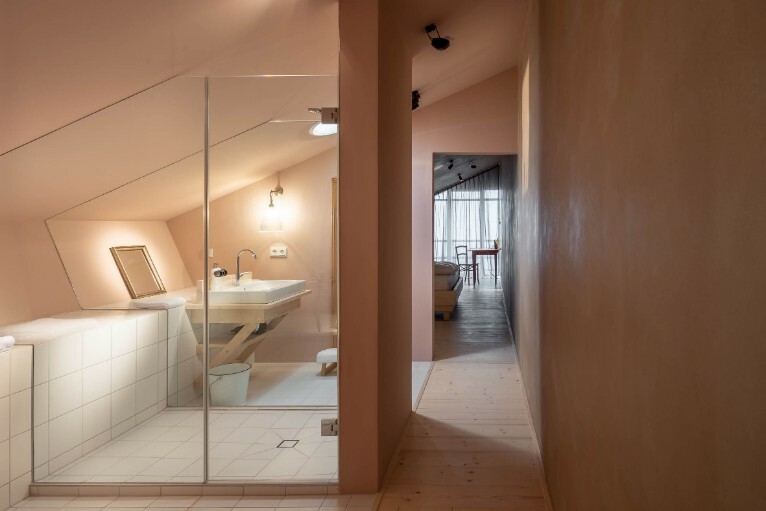 The interior with its red-stained screed is reminiscent of the former brickwork walls and lends the room a down-to-earth authentic atmosphere. 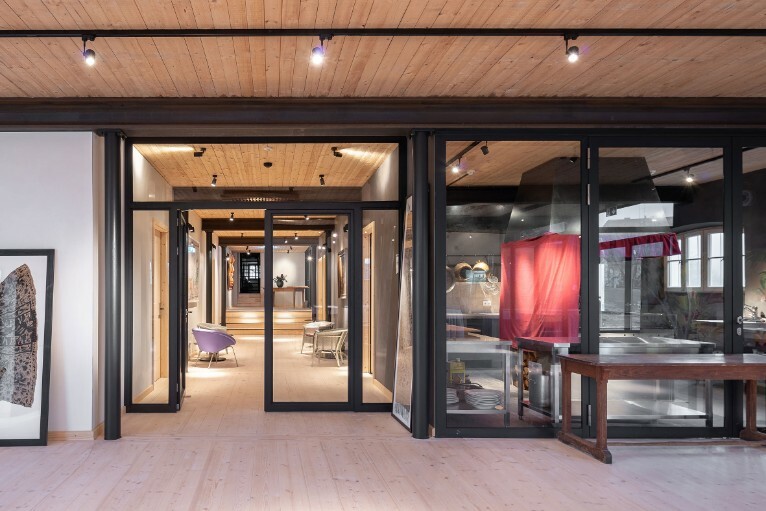 However, the owner’s most important endeavour was not only to worry about historic congeniality, but also to use ecological and sustainable raw materials. 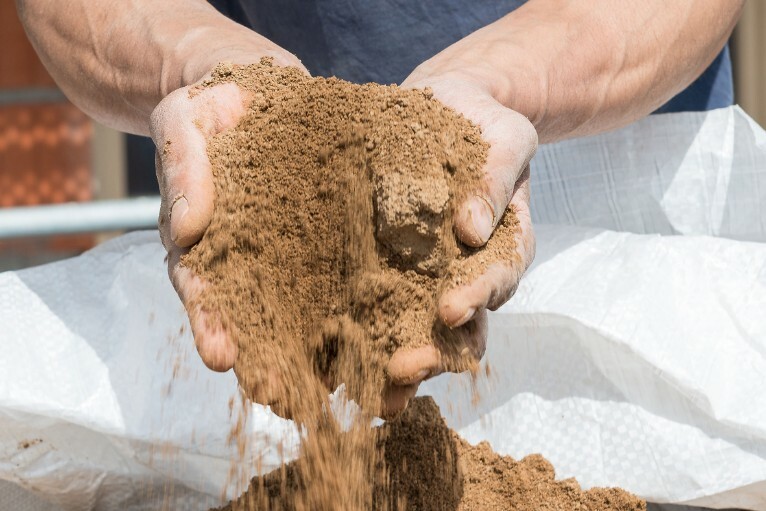 All construction work was carried out by only using natural materials such as wood, clay or jute form German manufacturer Thermo Natur, seated in Nördlingen, Bavaria. A wood stand construction was the basis for the overall construction as well as brickwork for the ground floor. 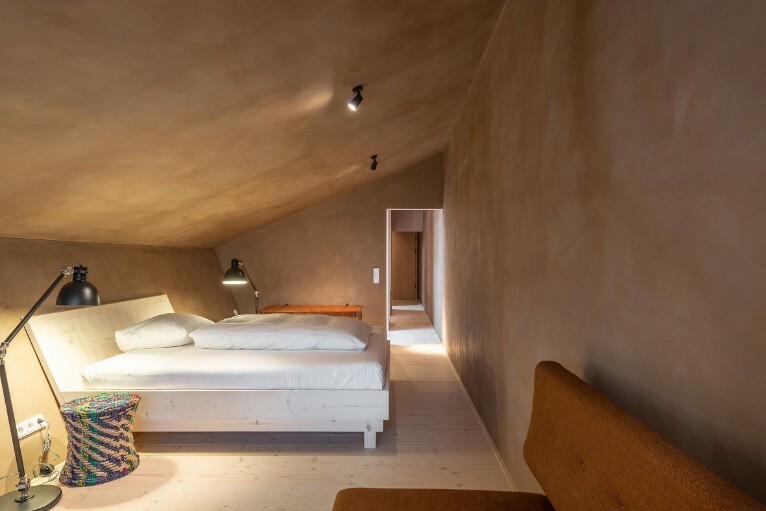 The interior was made up of clay building boards as well as clay plaster in different natural colours. 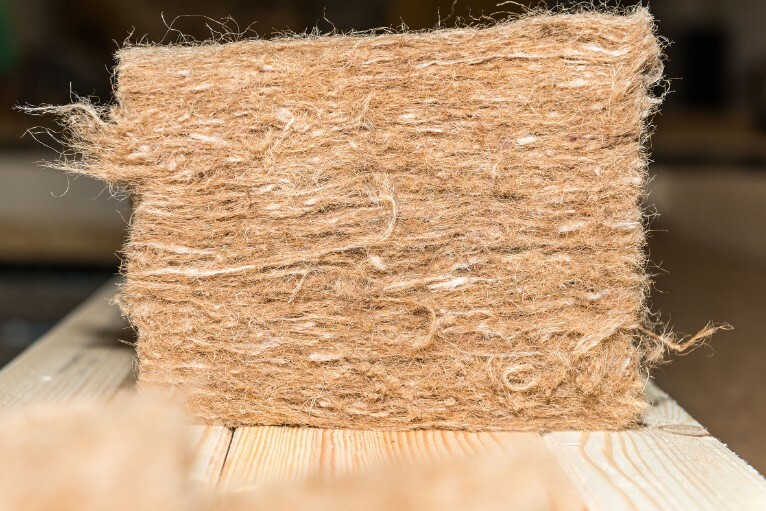 Jute bags which once contained cocoa beans were used as insulating material for walls and roof slopes. All rooms were equipped with the so-called Großeschmidt-heating system. It is based on the Roman hypocaust technique whereby the walls are heated via channels. 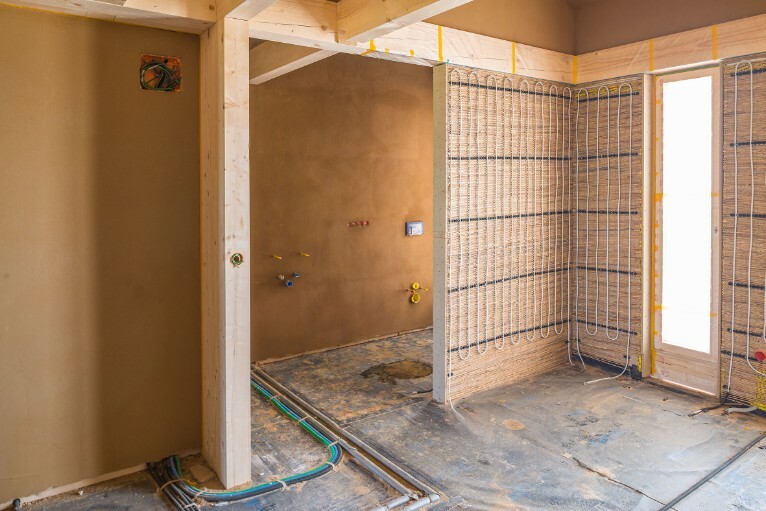 The walls instead of the air are directly heated and dried at the same time, which has various different building-physical advantages. 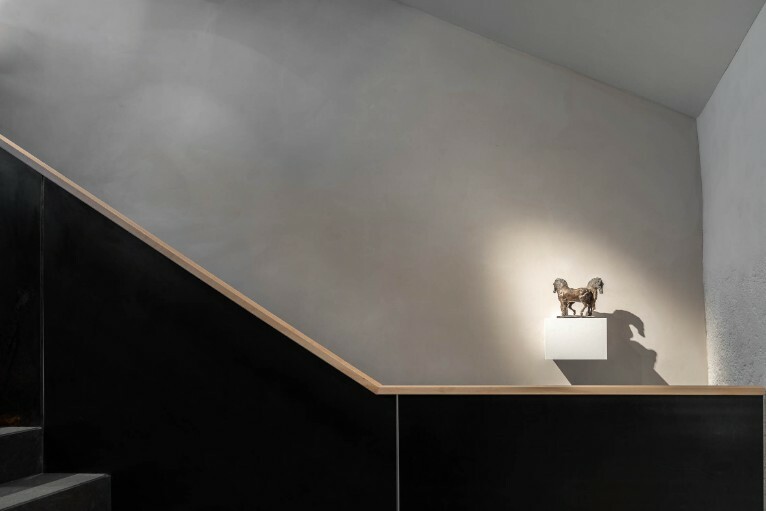 Two horses dance around each other, glowing in a diffuse light of the stairwell. This figurine by the late Claus Nageler is only one of the many small and large art objects exhibited in the farmhouse. Apart from Nagler’s estate that is being managed by the Schweisfurth family, contemporary paintings and photos decorate the rooms, as for instance works by Oanh Pham Phu, the Vietnamese artist and designer. The positions of the art objects were already taken into consideration during the ongoing construction work. Art plays a very special role, however, not “like a museum” but “fully integrated into our lives”, according to the owner. The objects are moved from time to time and create ever new perspectives such that the room itself becomes a living object of art. Georg Schweisfurth is also for changing perspectives. The well-known bio-pioneer is a studied economist and trained butcher. As son of the former meat imperialist Karl Ludwig Schweisfurth, who founded the Herta enterprise and led the company into the age of industrial meat production, he turned his back on the meat industry, once the family-run enterprise had been sold. 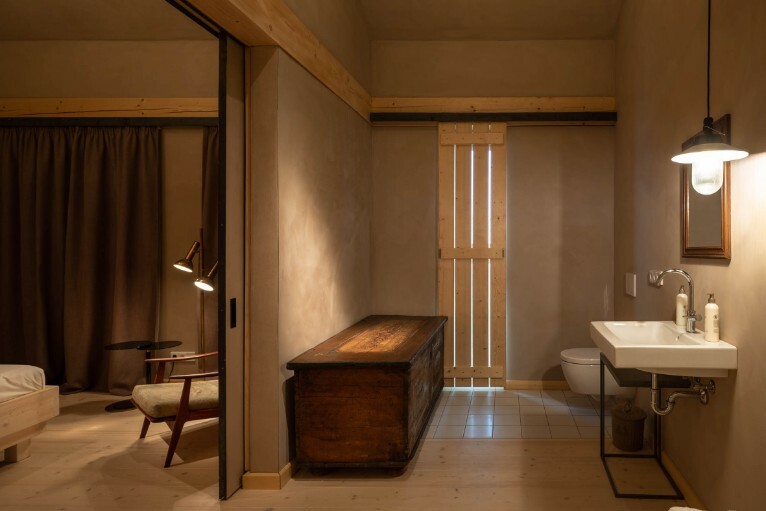 During the restauration of the farmhouse, sustainability was implemented right down to the smallest detail. After two years of planning and building it is now available preferably for exclusive conferences as well as individual holidays in an idyllic surrounding - far away from the noise and hectic of a city, guests are invited to enjoy a sensual cuisine, full of ingredients fresh from the own garden - maintained organically and responsibly not only with regard to nature but also with regard to people.